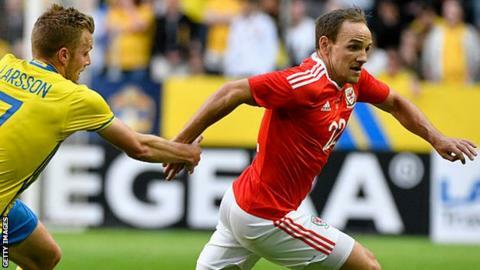 Wales midfielder David Vaughan has retired from international football. The 33-year-old was not in Chris Coleman's squad for the opening World Cup qualifier against Moldova in September. The Nottingham Forest midfielder won 42 caps after making his Wales debut against the United States in 2003, scoring once. "I tried to talk him out of because he's been with us for so long and he's got good quality. "But he wants to spend more time with his family and concentrate on his club career, and we've got to respect that. He's been a great servant for Wales." Vaughan was the longest-serving Wales player in their squad that reached the Euro 2016 semi-final although Vaughan remained an unused substitute throughout the campaign. The Abergele-born player started his career at Crewe Alexandra and has also played for Real Sociedad, Blackpool and Sunderland.